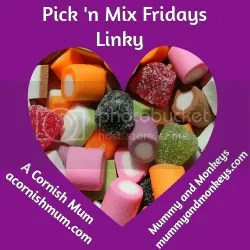 It’s Friday again which means it’s time for #PickNMix if you haven’t been here before welcome. The linky run by myself and Stevie at A Cornish Mum. Any post on any theme is welcome, old or new. An advance notice that there will be no Pick N Mix on Friday 27th as we are both taking the week off from the linky to spend time with our families. My favourite post from last week who can grab the badge above if they want was baby DIY handprinted clothes lookbook by Treasure Every Moment. I love them all, it’s impossible to pick a favourite. Head over and have a look at how talented she is. We previously changed it to make sure everyone got at least one visit and comment other than mine and Stevie’s ones, by saying that you should comment on the blog post before yours. Please make sure you are doing this when you link. 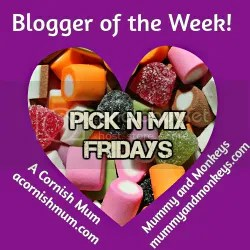 Remember though, that even if you don’t get many visits or comments from people through Pick ‘n Mix click throughs, we do retweet you which helps to get your blogs out there to others. You will be retweeted to over 19,000, and if you get chosen as our favourite blog from that week you get a shout out on the next week’s post including a follow link. "a letter To the woman I saw being hit"